North Korean pop group Moranbong has halted its goodwill tour of China – before it even began. 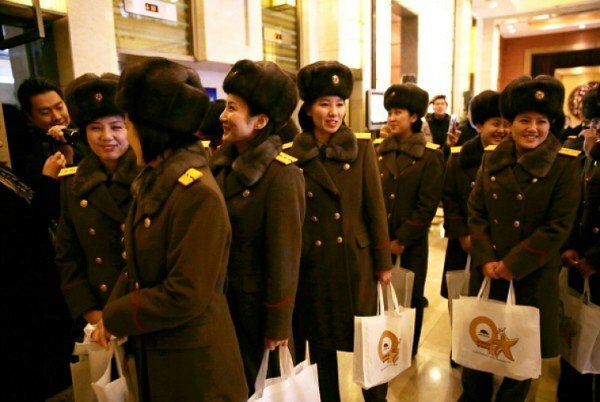 The all-female band unexpectedly turned up at Beijing’s main airport just hours before their first concert and flew back to Pyongyang. Moranbong were due to play three shows to help improve ties between China and North Korea. It is not yet clear why the performances were canceled. Moranbong is one of North Korea’s most popular bands. Its members were reportedly handpicked by the North Korean leader, Kim Jong-un, himself. The band plays a mixture of Western and traditional Korean tunes, and has been happy to perform the theme from the movie Rocky alongside patriot songs praising North Korea’s communist rulers. Moranbong members play a range of instruments, including electronic violins. In North Korea, the Moranbong musicians are also known for wearing revealing outfits and sporting fashionable hairstyles. The women were waved off for their first-ever foreign tour from Pyongyang railway station on December 9 by senior leaders. Dressed in military uniforms, they smiled and waved to fans when they came and went from their hotel after arriving in China. There was no hint of trouble when they practiced in Beijing’s National Center for Performing Arts on December 11. A Chinese foreign ministry spokeswoman confirmed the performances were aimed at improving ties between China and North Korea. She also joked that she did not know where to get hold of a ticket for the concerts. However, on December 12, the band unexpectedly arrived at Beijing airport and boarded a plane back home – a scheduled flight whose departure was delayed for several hours. Moranbong’s stage set was dismantled and its concerts were canceled. Neither China nor North Korea has given an official reason for the abrupt end of the tour. China and North Korea are allies. China’s Chairman Mao once said they were as close as lips and teeth. However, they have not always seen eye-to-eye over recent years. China has been particularly angry at three nuclear tests carried out by North Korea, the last in 2013.